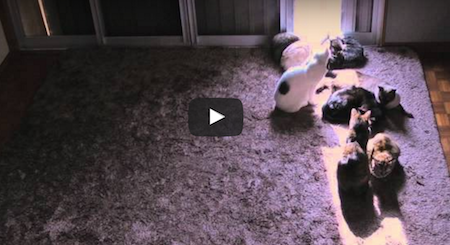 These Cats Were Lying On The Floor When All Of A Sudden They Stood Up And Did THIS! Summer is fast approaching and the sun is starting to warm up, brightening our days. But while us humans are running around buying barbecues, trying to find those perfect summer clothes, and slathering ourselves in sticky sunblock, our feline friends are taking it easy by chilling and soaking up those rays. A perfect example are these adorable Japanese house cats who love nothing more than relaxing in the sun. There’s just one problem…. As the day goes on, the son likes to move around. But these clever kitties have come up with their very own system of dealing with it.